Savour spicy cuisines that remind you of home. 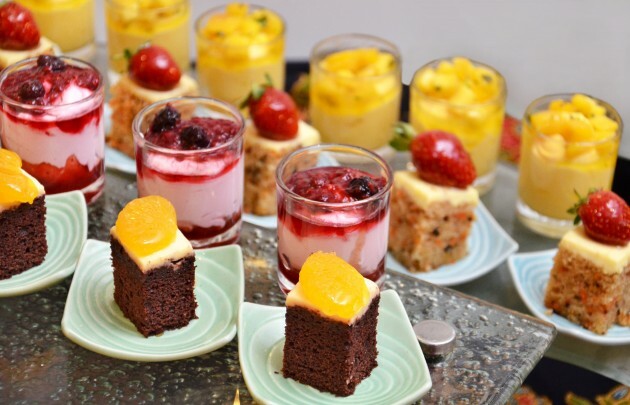 SUNWAY Hotel Georgetown’s Selera Nusantara Ramadan Buffet is back by popular demand, and once again features diverse flavours from around the Malay Archipelago. Available daily until July 25 at Sun Cafe Georgetown, it is an excellent option for those intending to break fast with friends and family, in comfortable surroundings. Their repertoires of six rotating menus include all-time favourites and time-honoured recipes that will have diners fondly reminiscing of home while tucking in. The hotel’s marketing and communications manager Siti Fatimah Packeer Mohd said the lineup encompasses the region’s rich cuisines, whose subtle differences are due to varying influences. “Response for the buffet was overwhelming last year, and we wanted to take guests on another gourmet journey this holy month. “We have dishes from around Malaysia, as well as Indonesia, Thailand, Singapore and Vietnam. The traditional tastes should resonate well with local tastebuds. “With little bits of everything, it’s a great sampling of the region’s culinary diversity,” she added. She suggests starting of with various choices of ulam, to go with several types of sambal. There are also starters like Vietnamese Shrimp and Glass Noodle Salad and kerabu, to dig into. 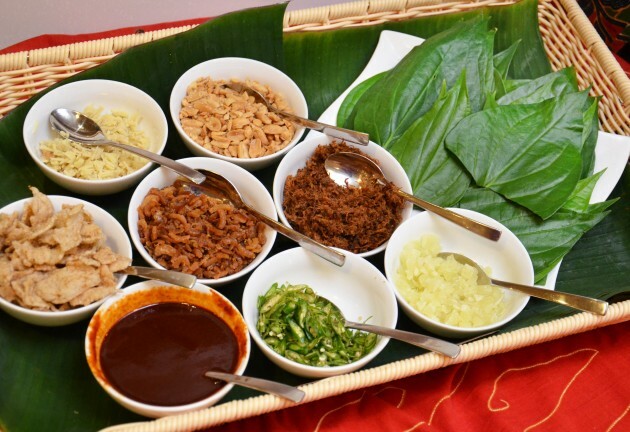 Otherwise, roll your own Miang Kham, a traditional Thai snack of wild betel leaves stuffed with condiments like roasted coconut shavings, shallots, chili, ginger, garlic, lime and dried shrimp. Help yourselves to a comforting bowl of sup tulang rusuk, with Bengali bread for dipping. The buka puasa must-have, bubur lambuk, is available in its original form. At the main dish section, trays contain delectable offerings like Masamman green curry chicken, one with a Thai influence, along with Sotong Masak Kalio, a lighter and richer Indonesian version of rendang. There is the aromatic Ayam Rendang Nusantara, which has a thick, flavourful gravy, the popular Rendang Daging Tok, and the spicy perut dan rebung masak lemak cili padi. 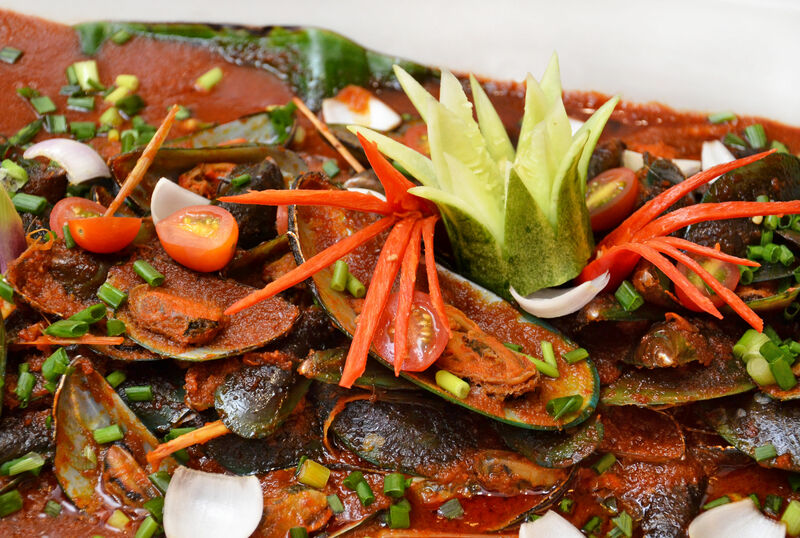 Seafood lovers should love the ikan masak asam pedas, kupang goreng sambal, and sambal udang petai Nyonya. pecel lele, an Indonesian style fish dish, and Nasi Dagang Terengganu, are among other notable items. If that is not enough, there are several action cooking stations featuring grilled leg of lamb, ikan panggang and daging salai. There are also pancakes, pengat pisang and ice kacang. But the standout has to be the Ayam Percik Kelantan, which is not only succulent and moist, but also flavourful thanks to its marinade. The special sauce that it is paired with simply enhances the taste. End the buka puasa feast on a sweet note. Sweet endings are assured with the dessert section boasting over 20 different treats from jellies to puddings, tarts, pastries, local kuih and even ice cream. The vast spread is served between 7pm and 10pm daily, and priced at RM48++ for adults and RM28++ for children, making it one of the cheapest buffets of its kind in town. “We also have buffet vouchers priced at RM55nett, which make ideal gifts for friends, family or corporate partners this festive season,” Siti Fatimah added. For the convenience of Muslim guests, the hotel has prepared prayer rooms for them to perform Maghrib and Isyak prayers. The hotel is also offering Ramadan Room Promotion Packages, with accommodations, breakfast/ sahur and Ramadan buffet, priced from RM230++ (single). For enquiries or reservations, call 04-2299988.